Wilbert de Joode (1955) is a veritable research scientist of bass pizzicato and bowing techniques. A self-taught musician, he has been playing the double-bass since 1982. He began working in groups that improvised within a jazz framework. Other musicians were soon drawn to his idiosyncratic style, and in the mid 80s he played in groups led by Vera Vingerhoeds, Armando Cairo and Ig Henneman where he further developed his improvisation skills. He came into contact with such musicians as J.C.Tans, Rinus Groeneveld, Michiel Braam, Han Bennink, Han Buhrs (Schismatics) and Ab Baars. 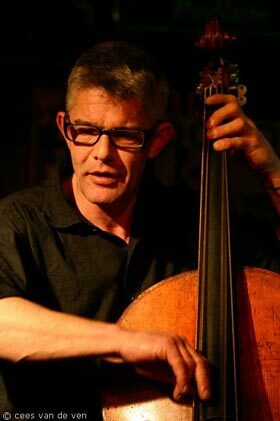 The seventeen improvised pieces on his first solo cd Olo (distributed by ToonDist (www.toondist.nl ) show how rich and complex his sound on the double bass is.